I had an assignment which I was supposed to complete from the Young Reporter's Workshop I attended in the early Dec. 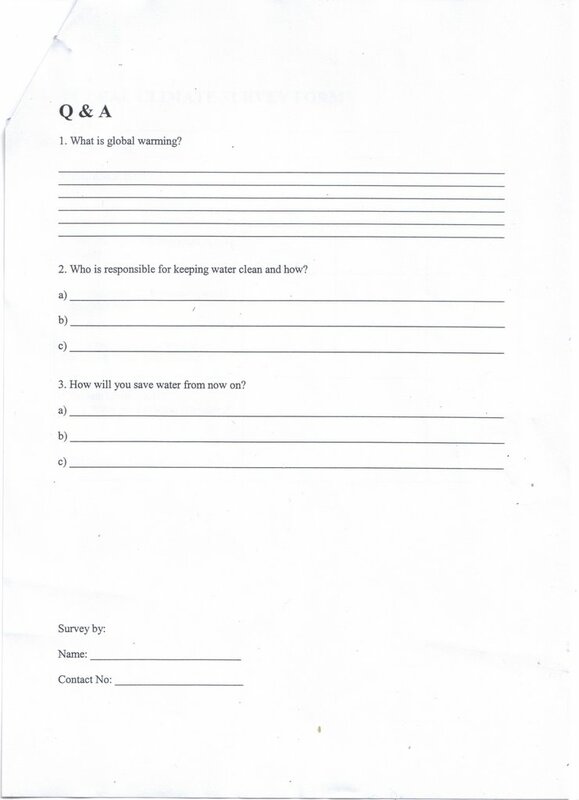 I was supposed to do a survey on 5 people on global climate and water conservation and hand it on 15th of Dec. But being the forgetful me, I totally forgot 'bout it after having a blast at my cousin's house for a week and missed the deadline until the NST people rang up my DAD and reminded him 'bout me not submitting the bloody assignment. They actually rang up my dad!!! WOW! This is more serious than not completing my schoolwork. They gave me 'till 20th Dec to finish it up. I feel a bit abused here (I have to photocopy survey forms, find respondents, etc etc.And what do I get? Nada! But I went to Ikano, anyway, to do the survey. I know I could interview the same people (mum, dad, grandma, grandpa, etc...) but I opted for something different. Journalists don't interview the same old people over and over again, do they? So, in I went to the post office with my mum.The PO seemed like a perfect spot to do a survey since the service was slow and people would wait a long time. Boy, was I wrong! The people there were really in-cooperative. They gave me all sorts of reason to avoid answering the survey. For god's sake, it's just a survey! One man said he could not speak English, (well,ok, that I can respect since he was an old man) and others when they said they could, after looking at it, they refused to fill in anything. One even complained it was time consuming and said she was in a hurry. Oh,yeah? Then why did I see her sitting at the same spot for another 20 minutes just staring at her nails when she could have actually answered a survey which would only take 5 to 7 minutes??? 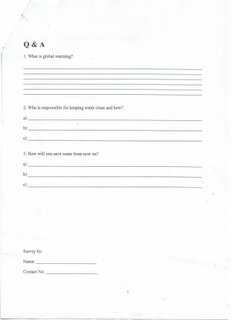 2. Who is responsible for keeping water clean and how? 3. How will you save water from now on? I noticed that when they were asked these questions, they hesitated before answering. Which just shows that we still don't get enough exposure on how to save the earth and make it a better place to live in. Hey, government and NGOs, your campaigns on water conservation, save the rivers, yadda, yadda, ain't working!! Malaysians unconcerned on the surroundings?? ?Not suprised at all.Their concerns are only on 'FOODS'! One message to all: grow up,please!! !